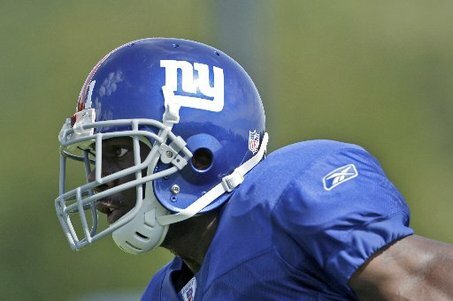 1) Note that we have provided a quicklink to NY Giants camp updates in the upper right hand corner of the blog. As always, we’ll try to cut through the fluff and post the salient comments and developments. 2) In yesterday’s lunchtime update, we noted that Stewart Bradley, the stud LBer with 150 tackles last season, is likely gone for the season with a torn ACL. Hey, the Eagles were not holding a benefit for us when Osi went down last year, so pardon us while we do not shed any tears for them or any of the other 31 teams in the league. Every team deals with these ugly injuries, so why can’t it be some other team for a change?! Let’s remember that starting S Terry Kinard went out during our ’86 run. That Simms went out in the ’90 run. That Kiwanuka (and Ward, altho that brought in #44) went out in the ’07 run. So injuries are a part of the game. Deal with it, Eagles fans. “It’s a major loss,” said Donovan McNabb. Yep. 4) Kenny Phillips had two picks. Coughlin: “Yeah, I was (impressed). Those were two outstanding plays, too. I was back here cheering.” Good color at the end of the video link on his strong progress. If this guy steps up big he is going to make this defense hum. Q. Does this team have the right pieces for success? A. Let me tell you…I haven’t seen a team like this, as far as depth-wise since I’ve been here, we’re solid at every position, I mean every position. I mean we look real good on paper right now, but as soon as we get on the field we’ll see what we really have. Q. Are you referring to just the defense? A. Defense, offense…we’re solid at every position on the field. Q. Is this deeper than the team that won it all a few years ago? A. Deeper? I would say so. I mean from a straight depth standpoint I think we’re definitely better. But I mean are we going to be as good? That remains to be seen. Q. When you went into camp last year, did you feel the same way? A. I felt good about last year too. Maybe not quite as strong as every position like we have now, but I did feel good about last year too. 6) We’ve been arguing here on the blog that WR is not the issue for the Giants. Pat Kirwin agrees. 8) I have a day job down here in NJ. But Ed Valentine at Big Blue View is there in person at practices in Albany. He is giving very good color. He offered the same strong sentiments about Bomar that Vacchiano gave. 9) Burress shoots the Giants in 2008… Pierce lifts the Giants in 2009. Is #58’s exoneration going to be a metaphor for this season? This entry was posted on August 4, 2009 at 10:00 am and is filed under Osi Umenyiora, Stewart Bradley, Tom Coughlin. You can follow any responses to this entry through the RSS 2.0 feed. You can leave a response, or trackback from your own site. Also thought it was worth noting that Kirwan mentioned Barden as having a tremendous practice on Monday, especially because Ralph V. didn't seem as impressed. Adam, Ralph V. didn't say anything terribly negative as he was impressed with his physical play in tight quarters. He summed up that he should be a big help in the red zone. Obviously, Phillips as he would really put pressure on opposing Os given that what they have to face up front with our DL and then be nervous about throing it up with Phillips roaming out there. Moss has continued where he left of from OTAs. Just hope he is utilized effectively by Gilbrown. Sintim in coverage which would be a HUGE bonus based on what we have witnessed recently with our LBs in coverage. Bhomar….just the words "quick, strong tight spiral" is enough said. Koets is a big concern as they don't have anyone behind O'Hara. Poors snaps, beaten badly by quick DLs, penalties…ugghh. Darcy Johnson I had high hopes for as a receiving threat. He has great size and speed but is earning his way to a 1st round of cuts. Bob- It means that compared to last year, when Manningham was a clueless rookie who got even further behind when he got hurt this time last year, he is doing.. er.. nice. At the pro level, being a WR is difficult. Some of the commenters here have successfully argued that WR is one of the toughest positions for rookies to come in and compete for (starting) jobs. So we eagerly await MM's efforts paying dividends.